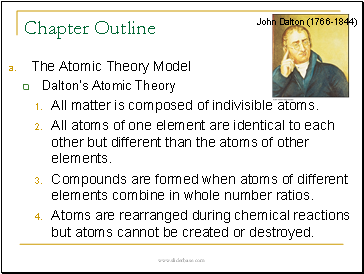  The atomic theory model was 1st proposed by John Dalton in 1803. 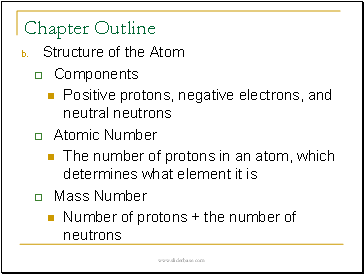  Atoms are composed of protons, neutrons, and electrons. 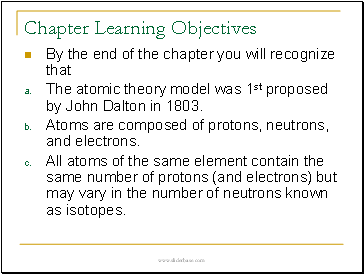  All atoms of the same element contain the same number of protons (and electrons) but may vary in the number of neutrons known as isotopes. 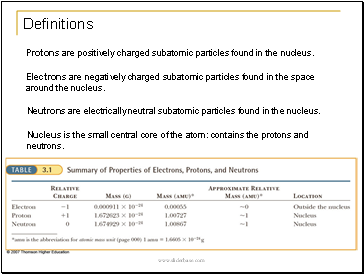 The protons and neutrons are found inside the tiny but dense nucleus, whereas the electrons are found in orbitals outside the nucleus. The arrangement of electrons in the orbitals is called the electronic configuration and determines the chemistry of an atom. The different types of atoms are called elements, which are arranged systematically in the periodic table. 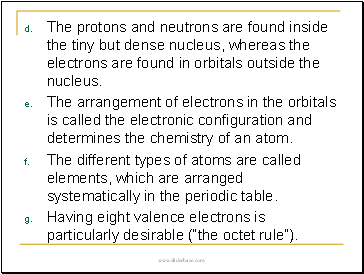 Having eight valence electrons is particularly desirable (“the octet rule”).  All matter is composed of indivisible atoms.  All atoms of one element are identical to each other but different than the atoms of other elements. 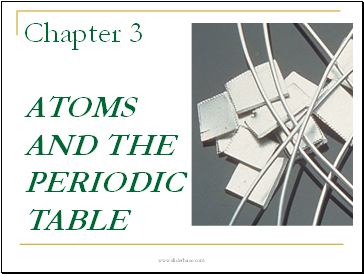  Compounds are formed when atoms of different elements combine in whole number ratios.  Atoms are rearranged during chemical reactions but atoms cannot be created or destroyed. Law of conservation of matter states that matter is neither lost nor gained during a chemical reaction. 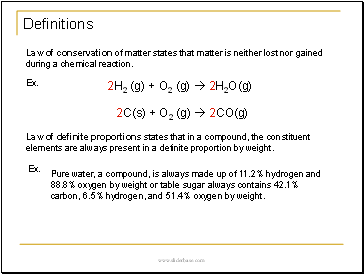 Law of definite proportions states that in a compound, the constituent elements are always present in a definite proportion by weight. Pure water, a compound, is always made up of 11.2% hydrogen and 88.8% oxygen by weight or table sugar always contains 42.1% carbon, 6.5% hydrogen, and 51.4% oxygen by weight. 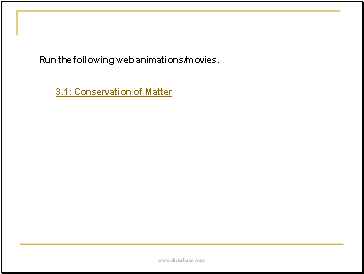 Run the following web animations/movies.